Inspire your child's love of reading! This pack helps your child learn to read in a fun and engaging way. 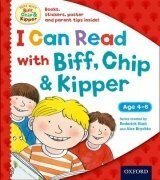 It includes a Fun Fact File all about Biff, Chip and Kipper and their friends, as well as four Level 2 readers from the Read with Biff, Chip and Kipper series. The pack also includes parent tips, a poster and stickers.